Given the outcome of recent events, Tony Starks should be on top of the world. The Avengers scored a major victory with their inaugural mission. Surprisingly, the head of Starks industries is now racked with anxiety. A new threat to national security has emerged in the form of The Mandarin, a colorful terrorist leader with a flair for the theatrical. He initiates a rash of bombings, the immediate aftermath of which have left little in the way of forensic evidence. As this crisis continues unabated, scientist Aldrich Killian returns from a self-imposed exile. Innovations in viral research have not only given him a new lease on life, but have emboldened him. He now means to take his rightful place on the world stage. In order to know peace, Tony must once again do simultaneous battle with personal demons, powerful villains, and former colleagues. With phase one of the Marvel Cinematic Universe now completed, one might think that Iron Man 3 can afford to coast along on cruise control. Nothing could be further from the truth. The Avengers upped the ante in a very big way. Once again, Tony has the spotlight all to himself (which I’d imagine is just how he’d prefer it). However, an ample amount of pressure has been brought to bear. Solo adventures are much smaller in scope than group adventures, and can feel less consequential as a result. This is especially true when the former is offered as an immediate follow up to the latter. With Iron Man 3, writer/director Shane Black proposes a simple yet effective solution to this problem. Keep the personal stakes high, thus ensuring that even the smallest battles have maximum impact. Cinematographer Matthew Libatique gave the first two Iron Man films the look and feel of a high-end auto show. The Machinery on display was both sleek and flawless. 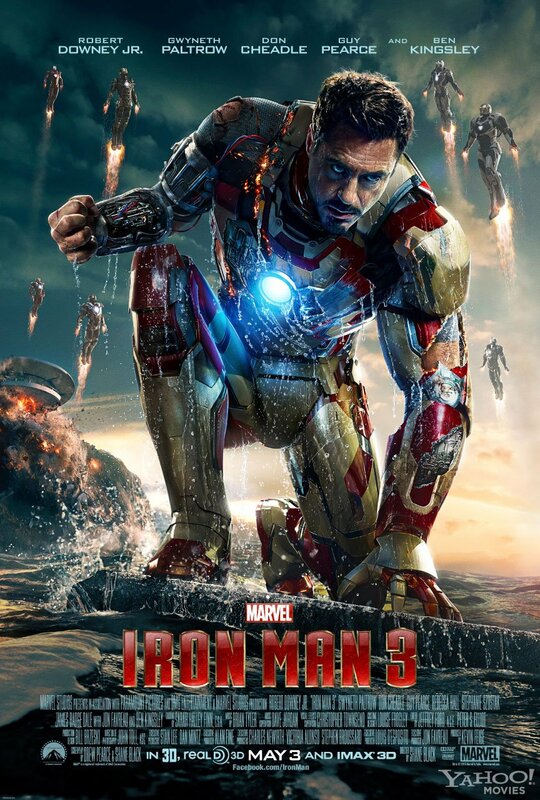 John Toll brings a different eye to Iron Man 3. He holds back on the Armor All and dials down the contrast. He also increases the resolution. Nothing is afforded the luxury of a cinematic airbrushing. This plays as metaphorical when considering the context of the story and its characters. Tony’s flaws and inner demons are brought heavily to bare this time out. He’s being stripped down to the bone and shorn of his worldly defenses. That’s just the kind of hero that Shane Black specializes in. Previous Iron Man films viewed the armor itself as Tony’s alter ego. He couldn’t do battle without it. Doing so has maintained the standard superhero dichotomy. Shane Black sees it quite differently. He makes a very clear distinction the man and the machine, so to speak. The armor is a weapon to be wielded by its creator. It’s an extension of him, and bears his signature, but he’s still very much a hero without it. A great many fans will surely cry foul at such a characterization. However, it’s much more in keeping with traditional action hero iconography. James Bond is still James Bond without the tricked-out Aston Martin. Snarky banter and sarcastic remarks have long been Shane Black’s stock in trade. They were a big selling point for many of his screenplays, particularly Lethal Weapon, The Last Boy Scout, and The Long Kiss Goodnight. He and co-screenwriter Drew Pearce provide Stark and company with some choice lines. However, they pour it on a bit too thick. It commences at such an accelerated pace that all but the most -savvy viewers will be struggling to keep up. Perhaps some that energy would have been better expended on the plot, which takes nearly half the film to find its proper footing. Neither flaws are fatal, but their effects on the overall product are considerable. Iron Man 3 has a stabilizing effect on the MCU. The Avengers was a raucous superhero party that left patrons in a drunken yet satisfied stupor. Iron Man 3 is a dose of aspirin washed down by a hot cup of coffee on the following morning, just before heading out to work. It cures the hangover and provides enough of a buzz to keep the user going. After all, there’s still more work to be done. The MCU is now a living, breathing entity. Hopefully, Stark can maintain the trajectory that Shane Black has set him on. It’s definitely a solid one, though it doesn’t quite instill the same level of euphoria as the original film.